The Reggiane Re.2001 was first conceived through the Reggiane Re.2000 Falco I before it, but the Falco I was rejected by the Regia Aeronautica primarily because of its engine. This was the main problem the Falco II set out to fix, now having a 1,175 hp Alfa Romeo engine rather than a 986 hp Piaggio one. The new Falco II was put on level by most experts with the Macchi MC.202, but the Macchi fighter was still produced on much higher levels. The Re.2001 was then delayed from use in the air force because the Regia Aeronautica insisted on the fuel tanks being placed inside the wings of the aircraft. The first order amounted to 300 machines, but it was later cut to 120 due to difficulties in the engine manufacture. The first planes were finally allowed to fight in June 1941. The CB (Cacciabombardiere, Fighter-bomber) version produced from 1942 could carry a 100 or 250 kg bomb under the fuselage for the attack role. The CN (Caccia notturno, Night fighter) version was adapted with the introduction of engine exhaust flame dampers and a 20 mm Mauser MG 151/20 cannon in two gondolas, one under each wing, although many planes retained the original armament. 34 CNs were produced of the 50 ordered. The Re.2001 was primarily used as a night fighter, performing raids into Malta. Later on in the war the plane was also used to defend northern and central Italy. Nine survived the split into civil war in Italy, eight going to the Italian Cobelligerent Air Force with the allies and one to the Italian Social Republic. 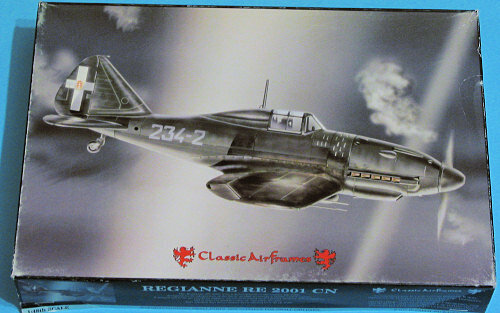 This is an older Classic Airframes kit from, well, I'm not really sure as there are no dates on any part of the box, instructions, or decals. It is the 25th kit they did so I have to assume we are talking about around 2000 or so; probably earlier. 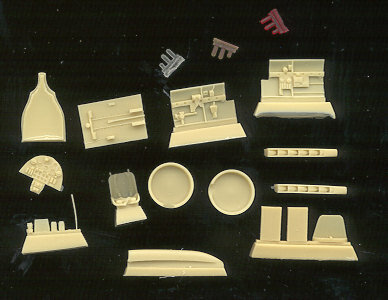 In line with just about all if not all their kits, it is actually produced by MPM and includes a small bag of resin and two vacuformed canopies. The molding is fairly good and typical of the time with finely engraved detail. The parts have a touch of flash and some that are thick have some sink areas, but nothing really all that terrible. There are also three small resin sprues with green, red and clear light lenses, something I've not seen in a kit before. Resin is used for all the fine detail stuff and this includes all of the cockpit, the exhausts, radiator intake, supercharger intake, main gear wells, and wing radiators. Actually, it is a pretty basic aircraft and if one wants to have a go at a short run kit, this one would be as good as any other due its simplicity. The builder does have to make the landing gear retraction struts, but that is easily done with stretched sprue. One thing you cannot build with this kit is the Re.2001CN night fighter. This is because the CN has exhaust flame dampners and under wing cannon in gondolas. Neither of those bits are included in the kit. Now it is quite possible that somewhere along the line, the bag with the CN variant was pulled out and a standard Re.2001 was put in its place. But whomever did this, left in the CN decals and painting/markings guide and the guide clearly shows the gondolas and flame damper exhaust, even though the instructions make no mention of it and are for the standard Re.2001. 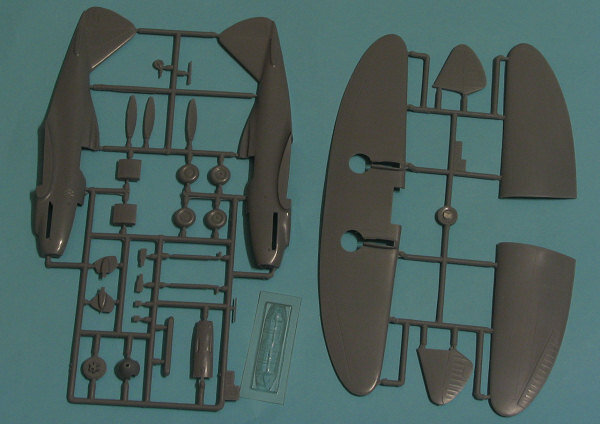 Now for me, it makes no difference as I wasn't planning on building the night fighter, but I have to wonder how many bought this kit for that very reason and were disappointed by the lack of these bits. I'd like to hear if anyone else had this happen to them or if this is an isolated case. Anyway, the small decal sheet is for the box art plane in overall black from the 234th Squadriglia and a co-belligerent aircraft with 101 Gruppo in 1943. This one is a standard plane in sand with olive green squiggles over light grey. Decals are superbly printed by Microscale. The co-belligerent insignia have separate centers and there are no insignia for the night fighter aside from the white cross on the fin. Actually, some rather boring options, but there weren't that many planes made. Frankly, I bought this kit because it looked like a pretty simple build as short run kits go. There are not a ton of parts, the resin is almost all concentrated in the cockpit. There is no photo-etch. Wikipedia, the kit instructions and the interweb. Thanks to me and the fact that people owe me money for this one.